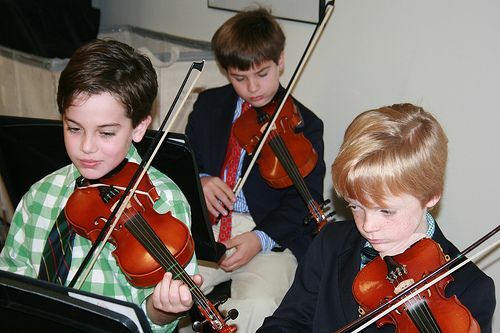 The Saint David's Ensemble is hard at work, practicing for upcoming concerts. During a recent early morning rehearsal, the boys practiced the scale of G-minor, in addition to playing their pieces and listening to professional orchestral recordings. The Ensemble at Saint David's, under the directon of Phil Hough, is comprised of musicians from Grades Three through Eight who join together to perform famous symphonic compositions from the classical repertoire. There are four performances each year for the student body. In addition, the Ensemble has recently performed at Alice Tully Hall in Lincoln Center and at Carnegie Hall. See photos from this year's Second Grade Turkey Run. Saint David's boys participated in the 45th annual Thanksgiving Food Drive, a school-wide community action project. In social studies second graders construct models of the Jamestown Fort, which they then exhibit to first graders. Using what they are learning about heat and air in science class, seventh graders constructed models of hot air balloons they sought to launch in Saint David's backyard. Saint David's families recently enjoyed a beautiful night of skating in Wollman Rink.